Several agencies and groups need custom books for their communities so we are trying to schedule a large bundled print by April 2015. If you or any agencies, businesses or nonprofits you know would like a customized version of our 266–page disaster preparedness and first aid manual, please call Fedhealth at 1-888-999-4325 to discuss your needs. The entire cover and title can be changed in the print process, and first 12 pages can be customized with local data, maps, reporting-in procedures, etc. in full color on glossy paper now. We discount our books 50% to 75% off list (or as low as $3.50 U.S. each + freight) and customize them for free. And, if needed, agencies, nonprofits and groups can upgrade to add 48 to 288 extra color glossy pages (for a total of 300 custom pages) to include advertisements, coupons or sponsorship messages, grant specific data and more for $5.50 US each delivered ($6.50 for businesses). Another advantage is this Public-Private Partnership tool provides grantees about a $3 or $4-to-$1 return on match due to the deeply discounted Government price and other donated goods and services. And funds can be committed within hours. Fedhealth is a small business, sole source registered on GSA’s SAM database, Ariba and various local and state procurement systems. Books make great educational giveaways for your employees, volunteers, members, customers and local communities esp. 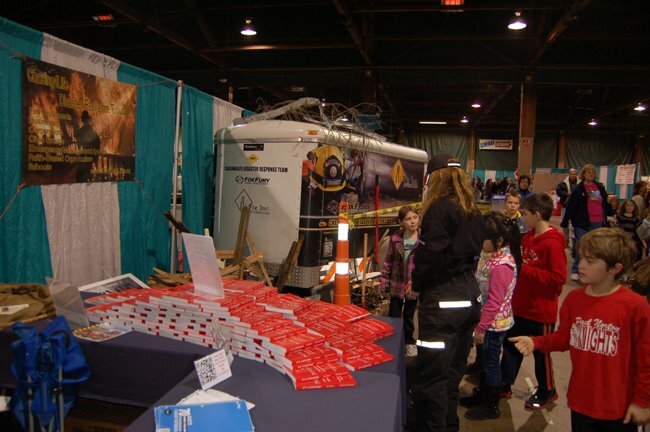 at events like PrepareAthon, health fairs, public safety expos, etc. Plus our customizable tool can help clear out leftover grant dollars that are time sensitive. Also … groups needing smaller quantities can always purchase our standard red books and personalize them with free peel & stick labels. We can ship red books within 24 hours of your order anytime so you don’t have to wait for a custom print. Learn more about our customizable book and fundraising ideas for volunteers, schools and nonprofits … or call Fedhealth at 1-888-999-4325 to discuss your needs. You are currently browsing the Fedhealth blog blog archives for February, 2015.